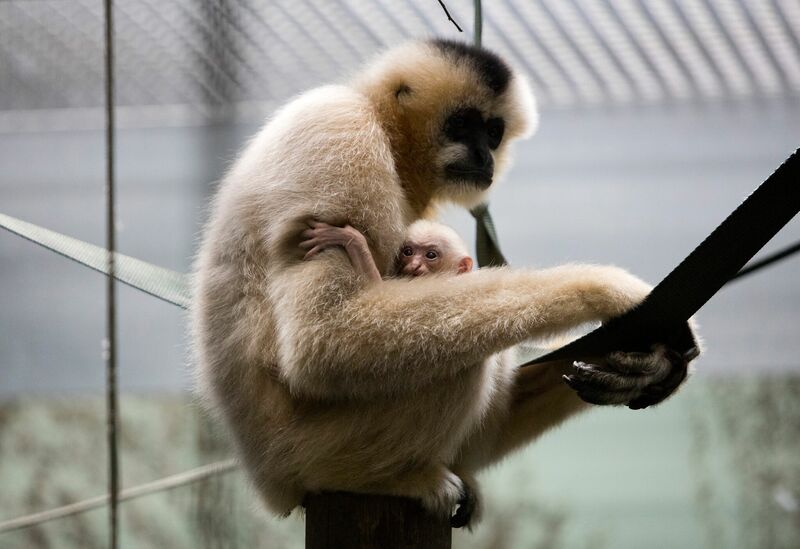 Twycross Zoo, Leicestershire, has welcomed the birth of a baby white-cheeked golden gibbon, the first of the year in Europe. The new arrival, who is yet to be named, is the fifth offspring to mother Kampuchea, originally from Oregon Zoo, and father Earl, who was moved to Twycross from Mulhouse Zoo in France. Northern white-cheeked gibbons are listed as a critically endangered in the wild, so the arrival of a new infant is a crucial step forward in helping with the conservation of this species. Gibbons live in monogamous pairs, so Kampuchea and Earl will rear the new infant together until it is mature, which usually takes place around six to eight years of age. All northern white-cheeked gibbons are born a cream colour, but males turn black with their trademark white cheeks when they reach two years old, and females, although they also turn black at this age, return to a mostly cream colour once they reach sexual maturity between the ages of six and eight years old. Last year Twycross Zoo opened its new state of the art Gibbon Forest, one of the largest gibbon facilities in Europe. Visitors wanting to welcome the new-born gibbon into the world will be able to see the new baby growing up and learning to swing with its group here. While at the zoo, visitors will also be able to check the progress of the young Bornean orangutan baby, which was born at the end of March. Both babies are an important addition to the zoo’s international breeding programmes.